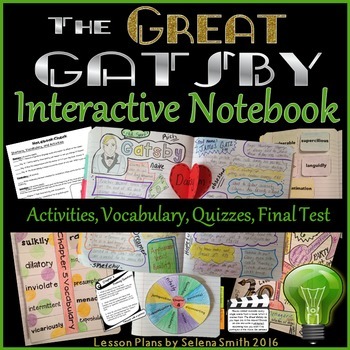 Great Gatsby Unit Interactive Notebook is a complete set of plans designed to use with interactive notebooks. You may have never even taught The Great Gatsby by F. Scott Fitzgerald before, but you will teach it like you have been doing it for years with this unit! - Pre-reading research and sharing activity - topics include prohibition, organized crime in the 1920s, fashion of the 1920s, and lots more. - Reading quizzes for Chapters 1, 2, 3, 4-5, 6-7, and 8-9 – These are true/false and multiple choice. These all come in 2 versions to deter cheaters. - Vocabulary quizzes for Chapters 1-3, 4-6, and 7-9 – These are multiple choice. These all come in 2 versions as well. Just get some paper, glue sticks, scissors, and colored pencils/crayons/markers and enjoy a stress-free 4 weeks of The Great Gatsby!